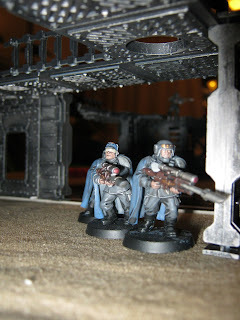 Ron’s defeat made me quite anxious about my upcoming fight against Peter, I’d lost the first scenario against him so he could pick the scenario as well, but since I managed to win the kill team battle I could force three of his units into reserve, hopefully disrupting his heavy support. I used the patrol mission force as a base, adding a unit of immortals as troops, two tomb spiders with accompanying scarab swarms (one of which had preferred enemy due to surviving the patrol mission). 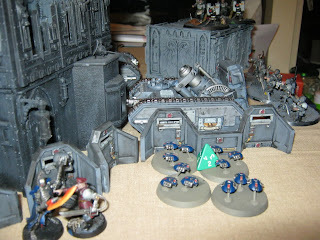 A unit of destroyers and a sprinkling of crypteks saw my overlords forces completed. Peter enlarged his platoon with more infantry and a lascannon squad. 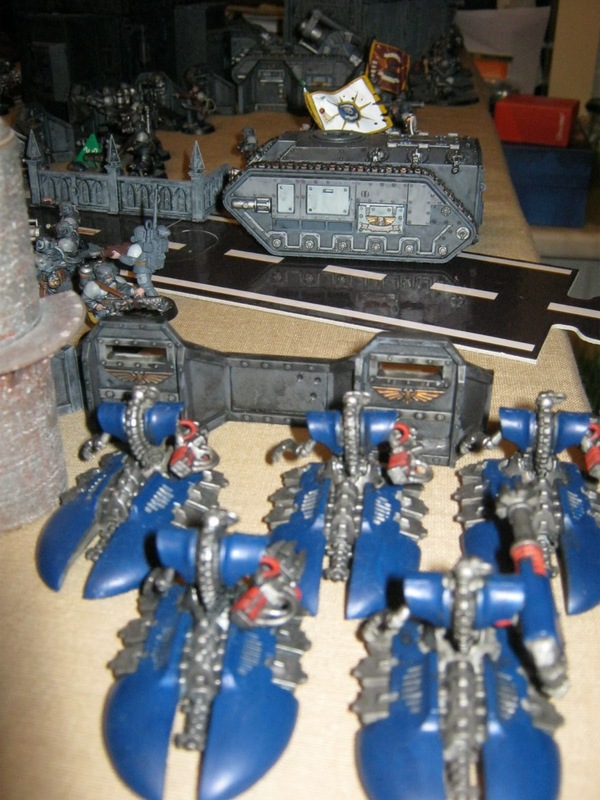 To support his troops he selected a griffon and a manticore missile launcher. 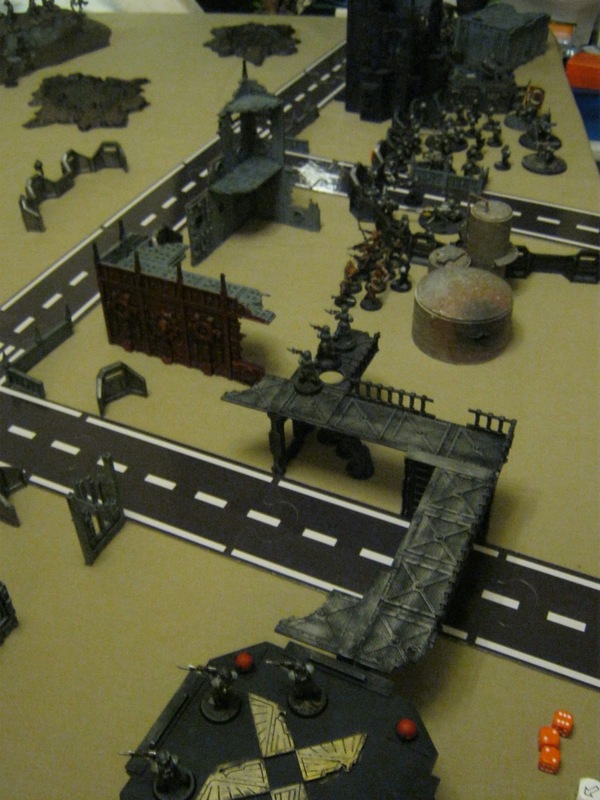 Some penal troops and a sturdy defence line rounded out the force commanded by his chimera mounted company commander. 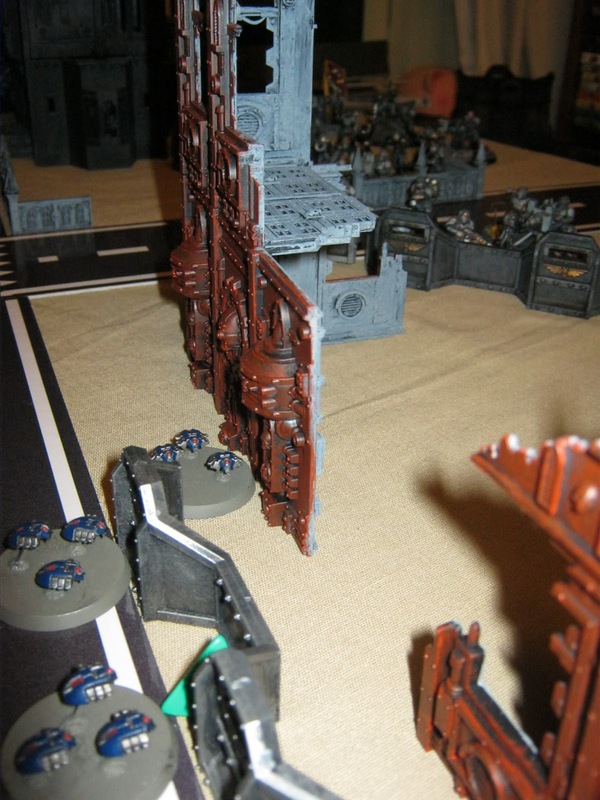 Peter chose the Crusade mission, placing his two force field objectives well inside the perimeter of his defence line. 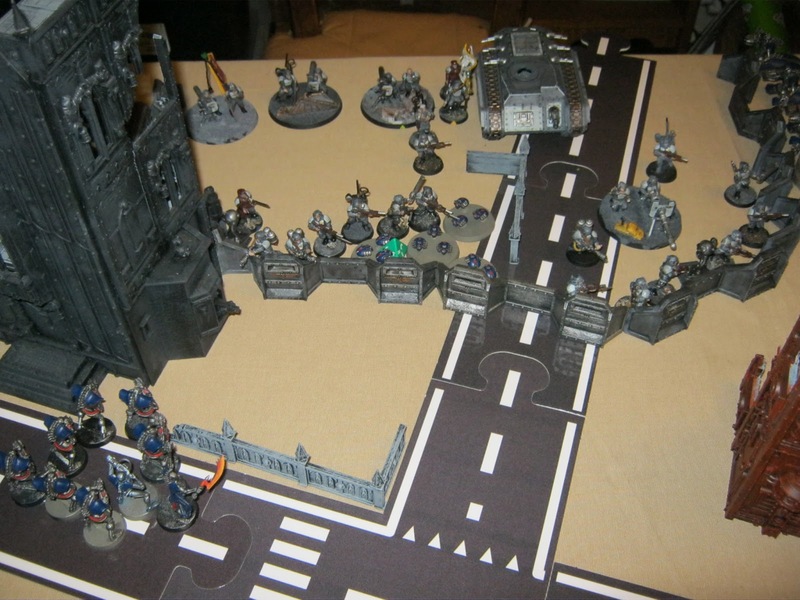 He gathered his forces within and around this defensive position, leaving a few units (amongst which the infamous snipers from the patrol) out to his left flank to distract my forces. I forced the Manticore, the mortar squad and his company command in reserve, depriving him from a lot of artillery blasts for the first few turns. I placed my in a long stretched line, with the swarms and tomb spiders taking the centre and the destroyers out on my right flank. 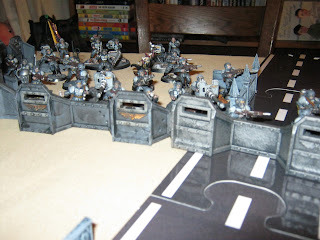 The plan was to send the scarabs forward towards the defence line in an attempt to keep those units occupied while my destroyers and a teleporting squad of immortals accompanied by my lord would attempt a flanking manoeuvre through the ruins. Peter’s first turn saw some sporadic casualties, but most of my troops survived because of the blinding artificial sunlight that one of my Crypteks cast across the battlefield. 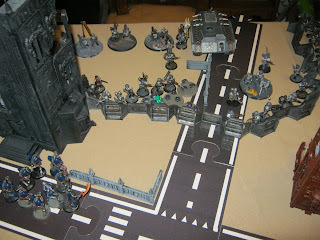 My lord seised the opportunity to teleport his squad to peters flank and clearly suffered from a distraction during phase out, and thus lingered in reserve for another turn. 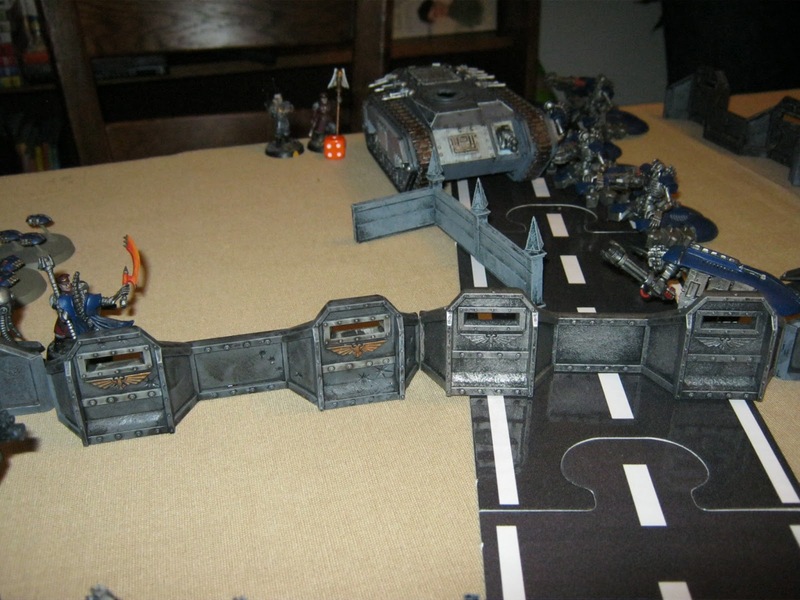 My scarabs however were able to advance on and assault peters knifewielding penal legionaires and wiped them out in a single round, clearly benefitting from the experience of the earlier encounter with the humans stored in their combat protocols. The next few turns Peter’s troops desperately loosed volley after volley in the advancing necrons, but some spatial distortion obviously scrambled their aim, as only one squad of warriors was seriously damaged, and many of his blastmarkers scattering of target or failing to kill the metal Xenos. 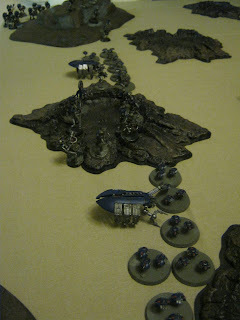 In the mean time my destroyers scattered the few units opposite of them and advanced towards the defence line, where whole swarms of scarabs had swarmed over the defences and assaulted the defending guardsmen. Peter’s friendly army selection saw him try a more defensive army setup that clearly didn’t pay off. His Hellhound flame tank and Marbo would have been a far more valuable addition to his force than the lascannons and snipers proved to be. 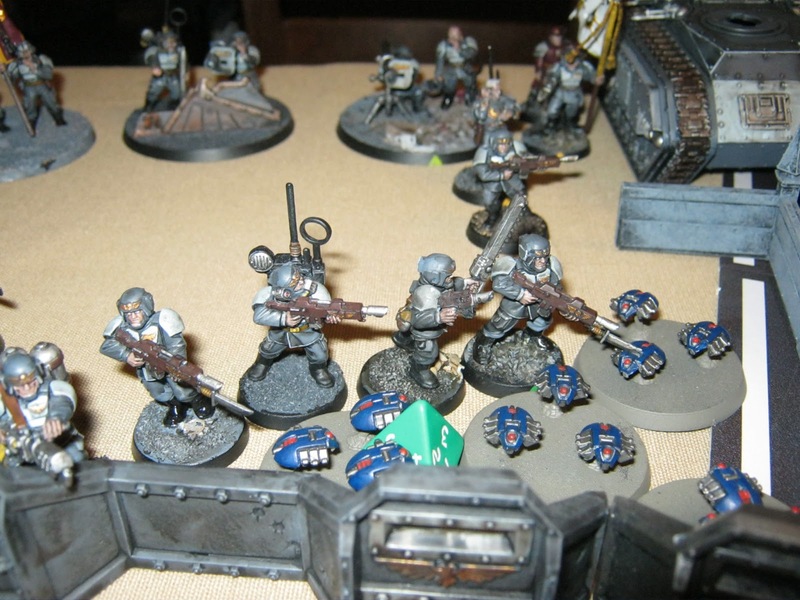 That combined with the mistake of deploying the penaltroopers in sight of the scarabs cost him dearly. All that remains now is to come up with a new mini campaign, perhaps an revenge assault of the Imperium against the Necron Tombworld? I really like the way your tanks paint up.